ディズニー Leading Ladies - glasses. . Wallpaper and background images in the ディズニー Leading Ladies club tagged: disney disney heroine jane meg esmeralda cinderella ariel belle. This is awesome! Did you make it? Jane: "Really? Glasses?...They make me look more stupid than I actually am!" Cinderella: "Don't laugh! I look dignified!" Ariel: "This doesn't even go with my seashell bra!" Tiana: "Ugh, I really do look like hipster, don't I?" Snow: "OH MY GOD WHAT IS THIS MUSIC???" 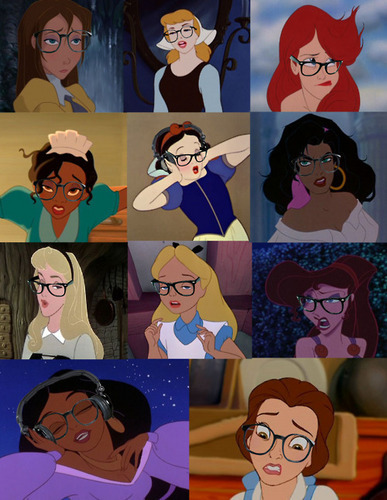 Esmeralda: "As if the single gold hoop earring wasn't hipster enough..."
Aurora: "I USED to be a Disney princess...too mainstream..."
Alice: "These glasses are too big-oh, I'm gonna sneeze!" Meg: "It's too cliche! I won't say I'm a hipster!" Jasmine: "This music is SO GOOD!" Belle: "GAHH! I used to be the most beautiful girl in town!..."